The Nordic Pattern Stencil 2, part of our exciting Nordic Stencil range, is ideal for creating your own on trend winter decorating designs. 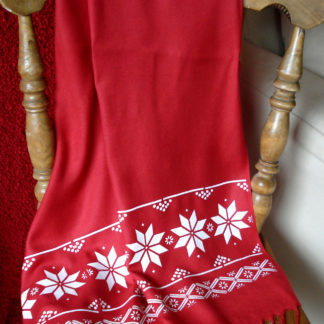 Stencil onto clothing accessories such as scarves or borders on cloth bags, or make your own cushion covers or festive stockings and greetings cards with Nordic pattern borders. 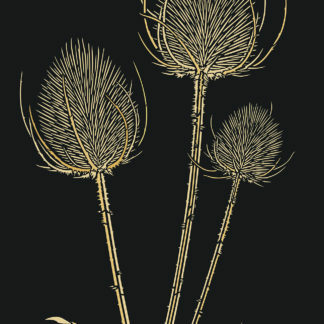 There are three pattern elements to this design, two narrow border style patterns and one deeper, which can all be used together or separately. 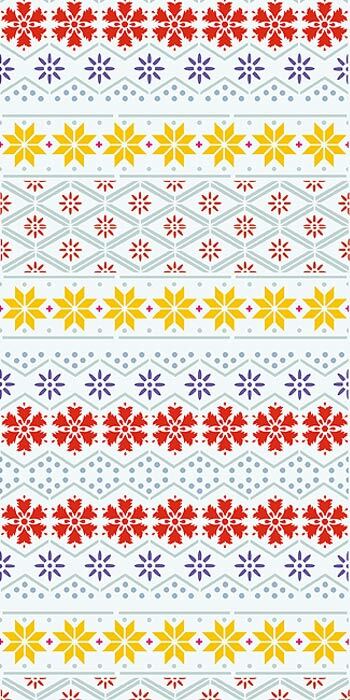 Create beautiful horizontal border effects, with the easy to use registration dots, or stack the sections on top vertically to create pattern blocks – great on paper for festive wrapping, or decorating shelf inners.See stencil layout and size specifications below. 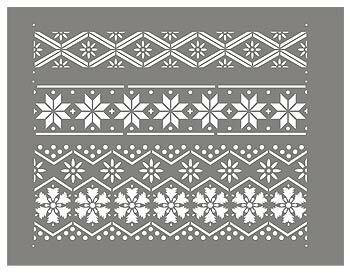 Also see Nordic Pattern Stencil 1 and the Nordic Border Stencil to use in conjunction with this design. 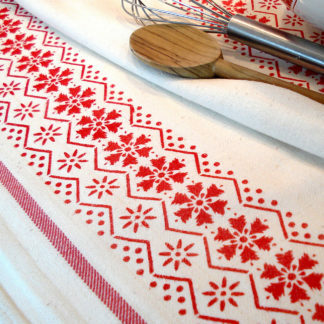 Stencil this versatile and easy to use design in white and red and metallic shades for festive decorating projects or in warm earthy terracotta, mossy green and heather hues for a warm Fairisle effect. 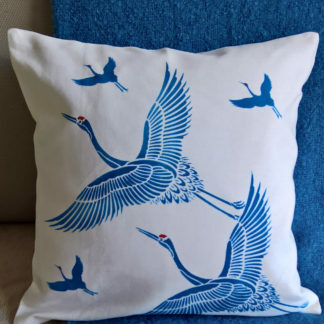 Above top – this beautiful cushion is decorated with Nordic Pattern Stencil 2, repeated in rows, stencilled in Strawberry Red, Bright Purple and Taupe Fabric Paints. 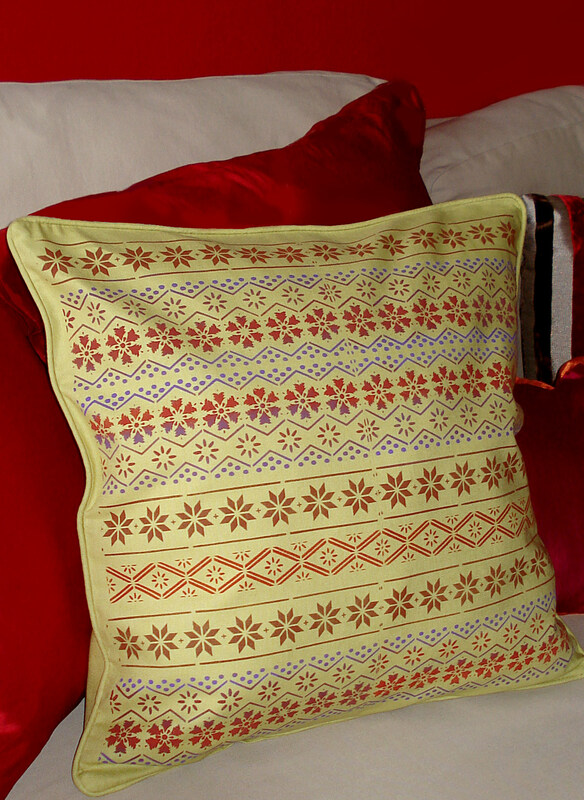 Above – close up detail of cushion in Nordic Pattern Stencil 2 (colours as above). 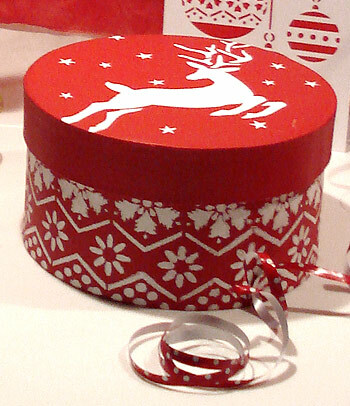 Above – Nordic Pattern Stencil 2 has been used to decorate the side of this decorative gift box in Ice White Stencil Paint. Also shown with the new Little Reindeer Stencil. 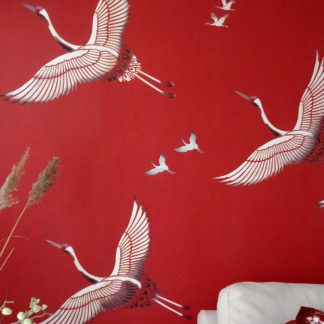 Above – the three border patterns of Nordic Pattern Stencil 2, repeated in a vertical block and stencilled in Raspberry, Very Berry, Verbena, Hedgerow, Storm and Arctic Grey Stencil Paints on a pale mint background. 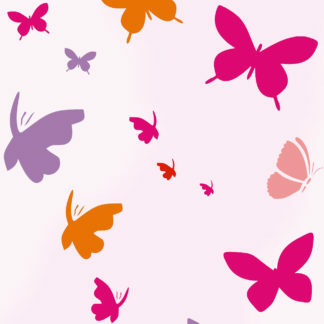 Above – Nordic Pattern Stencil 2 repeated horizontally as a border, stencilled in Raspberry, Very Berry, Cerise and Indian Purple Stencil Paints a pale pink background. 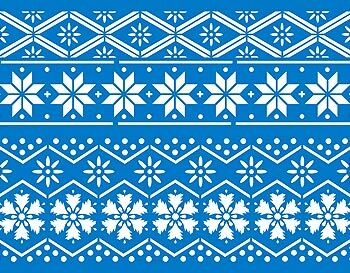 See also Nordic Pattern Stencil 1 and the small Nordic Snowflakes Stencil and Little Snowflakes Stencil. 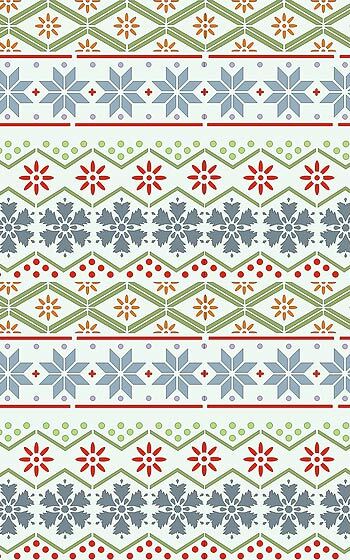 See also Nordic Pattern Stencil 2 and small Nordic Snowflakes Stencil and Little Snowflakes Stencil. Use the Motif range of Metallic and Glitter Stencil Paints to add extra sparkle and lustre to your creations! 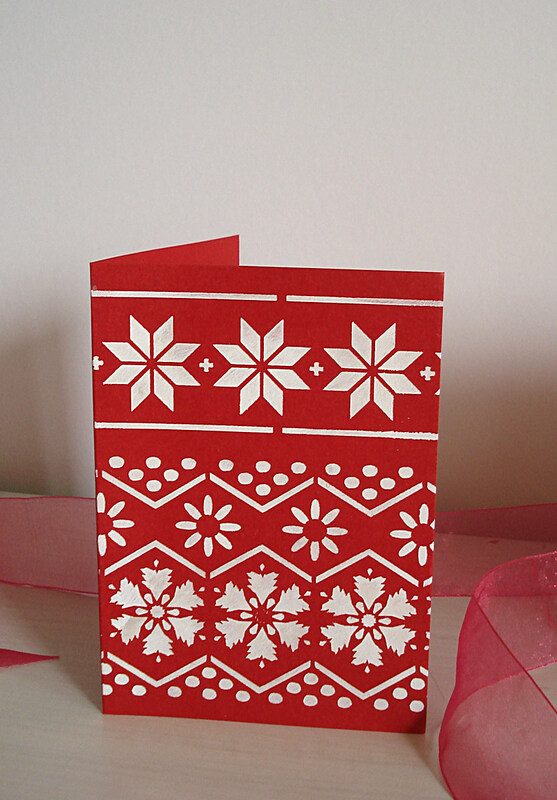 Above – create stunning Christmas cards with Nordic Pattern Stencil 2 in simple Ice White Stencil Paint on festive red cards. 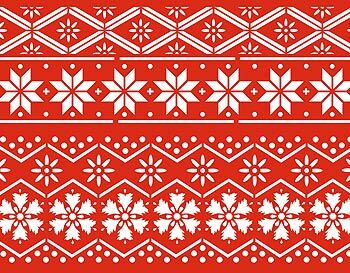 Above – all three pattern motifs of Nordic Pattern Stencil 2 in Ice White Stencil paint on a winter red background. Above – all three pattern motifs of Nordic Pattern Stencil 2 in Ice White Stencil paint on a clean turquoise coloured background. Above – create classic primary Nordic style with Nordic Pattern Stencil 2. Here the stencil is repeated vertically and rotated 180 degrees to create mirror symmetry and flipped back again. 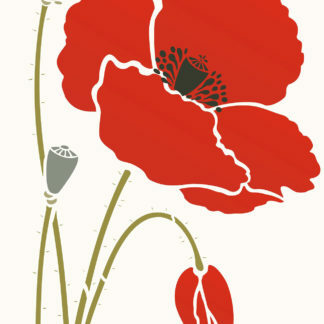 Stencilled in Very Berry, Cerise, Harvest Gold, French Lavender and Shoreline Stencil Paints. 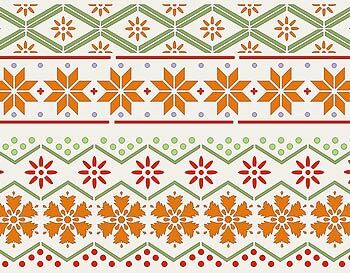 Above – one repeat of Nordic Pattern Stencil 2 stencilled in the warm tones of Raspberry, Seville Orange, Ash Green and Hedgerow Stencil Paints. 1 layer stencil on 125 micron mylar, with three border style motifs with easy to use registration dots. 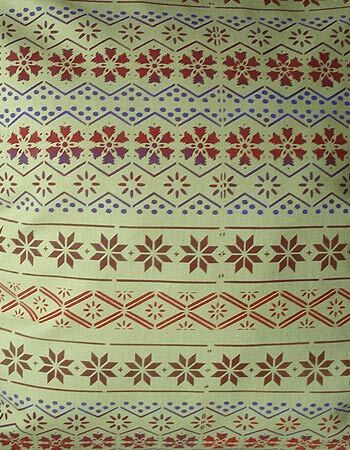 Top level pattern border up to 23cm wide (9″) wide x 4cm (1 1/2″) deep. Middle pattern border 23cm (9″) wide x 4.5cm (1 3/4″) deep. Lower pattern border 23cm (9″) wide x 8cm (3 1/4″) deep. 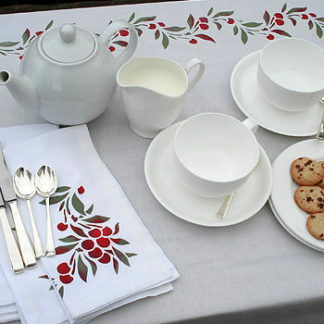 Sheet size 29.5cm (11 3/4″) wide x 21cm (8 1/4″) deep. Left – shows the layout of the stencil sheet for Nordic Pattern Stencil 2.